Here we go again! Scotland’s winter has arrived and this evening brings the first big winter storm ‘Abigail’ or A-BIG-GAIL (I’ve a feeling she may have picked up a few other nick names along the way). I hope you’ve secured your garden furniture? We don’t want you starring in the next ‘Trampoline’ video posted on Facebook. Curl up on the sofa, stay safe and just in case…. 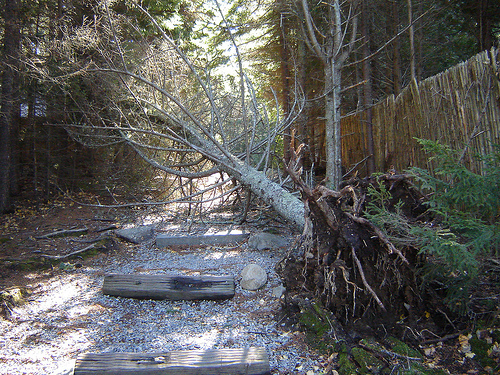 Here’s some helpful advice should you be faced with storm damage caused by tree fall. After a storm, there is always a big clean up process that all property owners face. The trouble is that most people will look at the devastation and don’t have any idea which trees can be saved and which trees cannot be saved. That’s where an expert tree service comes into the picture. An experienced arborist will come out and access the situation on your property. They will be able to tell you which trees can be saved or not. When it comes to trees, they have seen everything. Their experience means that they have vast knowledge to help you solve problems in any storm clean up scenario. Some trees will require a simple trim to survive. Others may need to be staked and supported, while others will unfortunately need to be removed. You should keep in mind that, when it comes to trees in storms, there are basically six types of storm damage. For example, there are blow overs, stem failures, root failures, branch failures, crown twists and lightning problems. It is true that trees are strong, however, even the strongest tree will reach a crisis point. A professional tree service will make every effort to save as many trees as possible. They know that your safety and your family’s safety is first priority. If we believe that lightning damage, wind damage or any kind of damage has occurred which could potentially threaten your family or your property, we will do an assessment and work with you to solve the problem. For example, if a tree has come down on a power line, that could be a serious risk for you and your family. In such a case it is obvious that the tree must be removed as soon as possible. Such a delicate operation will require the services of tree removal professionals who will have the proper equipment and carry proper liability insurance. Not only that, they must have knowledge of power lines and electricity to safely rectify what could be a potentially dangerous situation. As everyone knows, downed and damaged power lines can spell death and disaster. Remember after the storm to contact a firm that specialises in all aspects of tree care. You should feel confident, that after careful inspection, your trees will be tended with an eye to saving as many as possible. In most cases much of the damaged vegetation will simply require a trim, or a topping. No matter what the time of day or night these experts can get the job expertly attended to. © Cairns Tree Surgery All Rights Reserved. Theme zAlive by zenoven.